Last Wednesday I waved Michelle and the ‘year 13 crew’ off for the last time. Three days away and this chapter of Shell’s life closed. What a chapter it’s been. An incredible time of growth personally and spiritually – which was what we were hoping and praying for at the start. Yet how God acted to bring about this growth in maturity in Shells was not what any of us had in mind! Yet I can honestly say there has been blessing which has surpassed all the stress, fear and pain and I think Shells would say the same. Michelle had her heart surgery on October 11 as scheduled. We were all anxious – understandably. We prayed that God would make it all proceed routinely and the people who were interacting with Shells would take their time to be kind, not brusque. And mercifully that was what we experienced. Michelle went into surgery with an anaesthetist who was an older gentleman who was just that – a gentleman; gentle and reassuring. He is one of the best in his field who assured us that if he needed this surgery done, he would want Dr Lo to be the person doing it. After the surgery, and also the next morning, Dr Lo came and spent more time than I am sure he had, to explain how it went, to show us an “Amplatzer device” the same as what was installed in the hole in Shell’s heart, to take an x-ray to check the amplatzer device was still in place and answer our questions. He is a natural teacher so our questions and his answers led to more questions and more answers. We learnt a lot and are very thankful for him – his skill, manner and patience. Since then Michelle has been feeling stronger and more energetic. As a result she’s been doing more and then is still surprised by her level of tiredness. I think she forgets it is only 4 1/2 months after a significant stroke and she is doing remarkably well. We were told that it can be 12-24 months before the unusual levels of tiredness resolve. On October 26 Michelle had a ‘stoke review’ with the stroke nurse at Liverpool hospital who acts as an overall case manager – checking that Michelle is being well looked after in every area of recovery – neurological, cardiac, mental health, physical health, rehab etc. She was great and we saw again the MRI images of Michelle’s brain. If you imagine the left hemisphere of a brain and sliced it into 3 pieces like you may cut a cake, the middle 3rd had been oxyen deprived and resulted in damage and death of those brain cells. I am a little unclear what this means re: recovery of that specific tissue. But dead cells are dead cells. Neuroplasticity means the brain re-organises itself to carry on the functions of that area of the brain using other parts of the brain. Do those dead cells remain completedly dead? I am unsure of the answer but I do know that we have every reason to believe Shell is well on her way to making a complete functional recovery. If you met her in the street you would have no idea she had a stroke this year. We have no doubts Michelle will be able to manage this degree although a part-time load will be required at first due to slower cognitive processing and stroke related tiredness. She continues with the excellent therapy offered at Royal Rehab in Ryde. Shells has speech therapy and exercise therapy twice a week and is often sweaty and red-cheeked at the end of her rehab time as she is pushed hard physically to recondition and build endurance. Michelle continues to reach and exceed goals for recovery and is feeling very positive about how far she has come. She was thrilled to be able to share her experience and assurance of God’s love for her (and the world) with one of her therapists and continues to do this with everyone who cares to listen. We also want to say thank you. Thank you for your care, love, interest, prayers, encouragement, practical aid and understanding. We have been overwhelmed by the love and care – even by those who don’t even know us. Onwards we go by God’s grace alone. Tomorrow Michelle will undergo an operation to repair the hole in her heart. We are incredibly thankful that Dr Lo believes she is a good candidate for the repair to be done via a vein as opposed to open heart surgery. We don’t know what time this will take place as yet. We’ll find that out later today. It may be just day surgery or she may stay in Liverpool Private overnight for monitoring (assuming everything proceeds without complication). God has supported us every step of the way; we have felt upheld and loved by many and have no reason to fear. For however tomorrow plays out, we know God has it all under control. Nonetheless, I/we confess to feeling a little worried about how it will all resolve. It feels like a big deal. We are truly amazed at her grace and faith day after day. For those who pray: could you please pray all goes smoothly tomorrow? That the heart repair is straightforward and that all the staff are on their ‘A-game’? Please thank God for his love and care of us directly and through so many individuals, for living in a country where a heart can be repaired seemingly easily and for Jesus… knowing Him changes our lives for the better, day by day, because we know what is most important: life eternally with Him even if we have temporary struggles now. Hello, friends of the Blogosphere! Shell here. 1. I am having the hole in my heart closed up through surgery on the 11th of October. I am very thankful that it will be only a 1 – 2 hour surgery. For those who pray, please pray that the surgery goes well and easily, and that my anxious heart will be calm! 2. We have had an appointment with the neurologist (aka ‘The Jacket Man’ – see prior posts). He is hopeful that I will be completely back to normal in due time – praise God! 3. I came out of rehab on the 30th of August – hooray! 4. I have seen the rehabilitation specialist, the ophthalmologist, the cardiologist, the neurologist, the haematologist, the GP, half a dozen pathologists and had an MRI. Fun times!!! I was thinking today about seasons. 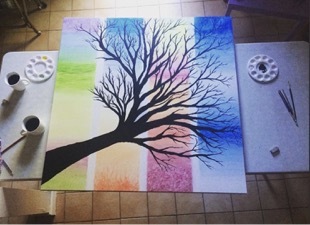 My friend Cait and I made a painting at the end of last year to be put up at our old School, which you can see in the picture below. As seasons change, we forget how the sea feels when it is actually warm enough to swim, or the peace that comes when you sit in the sun and watch how nature grows again. Just like everything in life, my stroke experience has been in seasons. I often forget how far this journey has brought me. I was reminiscing today about the first session I had with my speech therapist in Liverpool Hospital. She pointed to the ceiling and said “What is this?”, and all I could say was “umm… sky?”. It is an absolute miracle (as the specialists keep telling us!) that tonight I have sat down at my computer and written a whole blogpost, stringing sentences together and coming up with words on my own. This is all due to my amazing speech therapist, Lily. I was at Royal Rehab Hospital for two weeks of extra rehab and now I am home, I go into Ryde two days a week. I liken my speech therapy to playing “connect the dots” on a piece of paper. Each session, more and more lines are redrawn in my brain. It is hard work, I am tired a lot of the time and can’t always do everything I want to do but considering the first season of this journey, I think I am doing okay! Sure, there are times when words escape me and I say words incorrectly. Just last Thursday I was in the car with my friends on the way to Year 13 and asked something about the windowsill in the car (of course, I meant the windscreen). The week before that, I asked where my balloon (pillow) was. Thankfully, I have amazing friends who ask what I meant, and then can have a good laugh about it afterwards. I am so grateful that I can now (often/ sometimes) notice when I say things wrong. Communicating is such a precious, vital part of the human experience. And even more so, thanks be to God that we have a Creator who communicates with us! I remember sitting in a hospital bed in Dreketi, the small rural town I was staying in, in Fiji. I couldn’t communicate or understand what the people around me were saying, but God knew. My incredible leader, Emily, tried to get me to write, just to see what I could do. I sat there, staring at a blank page. After a few minutes, I wrote ‘panic’ (misspelt), and ‘it’s hard’ (evidently). But, I kid you not, my hand wrote another word. I remember sitting there and staring, wondering where that word came from. These first seasons of this journey have been challenging, tiring, amazing and truly miraculous. Although I am very much enjoying being able to communicate with my family and friends, I am so thankful that Jesus is the only person I will ever need to communicate with. This journey is the season’s of His grace – He is sufficient. Home for a week now! Michelle has been at home for eight sleeps now, and we’ve had what I call a ‘Skittles’ week. Do you remember the advertisement where it begins “Hey Tim, show Joel how everything you touch turns into Skittles”? I feel like this is how time is functioning at the moment… in a heartbeat, it just dissolves away. Shells returned with her friends to the Year 13 Campus for two days last week. This was the return of everyone for term 3. She headed off again this morning. We dissuaded her from sleeping over and requested she didn’t attend classes as the socialising and structured group times would take up all her energy. She MOSTLY complied, yet did overspend from her power bank account. After an outing to Macarthur Square on Saturday with a few friends (our local large shopping centre), she was spent. Her word finding skills deteriorated, she had no energy to do any therapy and was too tired to go to church. The upside was she was happy-ish with the trade-off (Her parents weren’t as thrilled 😉 ). 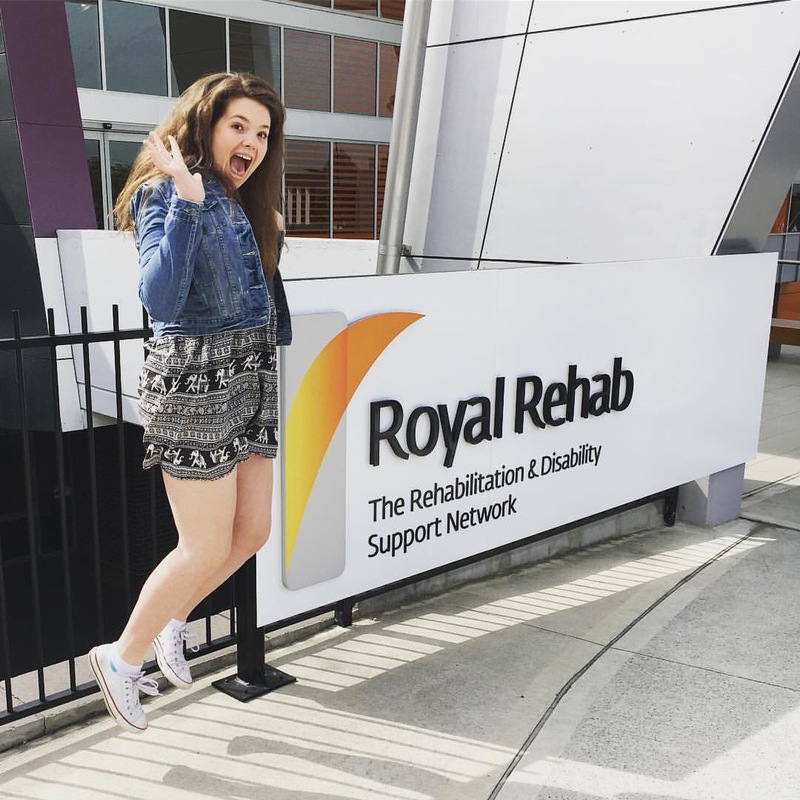 Our friend, Kate Makin, who has known Shell for most of her life, is a speech pathologist in a private rehabilitation facility in Ryde called ‘Royal Rehab Private’. She invited us to come and see what they could offer us if we chose to opt for some more intensive inpatient therapy. We met all the key people who would be involved in Michelle’s therapy, and they were so lovely and enthusiastic to help her. The place is modern and a very positive environment (if a little far away) and Michelle would have a private room. Although Michelle wishes that she wasn’t dealing with any of this, she is relatively keen to take advantage of this opportunity. I think we’ve said this more than once before, but recent research on the brain reveals that the first few months after a stroke is when the brain is working very hard to return to functioning at a rapid rate. The more directive the therapy is at this time, the greater the likelihood all of Shell’s higher order thinking will be recovered and ready for uni next year. Natural healing will still take place in her daily activities even if we don’t take up this opportunity. She is entitled to speech and occupational therapy in the public system once a week, but having been made aware of this cutting edge service being available to Shell, it seems crazy not to take advantage of it. The ophthalmologist was a brusque lady but very efficient and seemingly capable. The results were normal which means the earlier impairment has already healed. Praise God! Next Monday Michelle will have a cardiac MRI to assess the hole in her heart in preparation for surgery. The following week we see the neurologist and cardiologist again. My expectation is that we will then have a date for the surgery. Please continue to give thanks to God for Shell’s amazing recovery. Again – my speechie friend Kate reminded us that people who have strokes in their Middle Cerebral Artery would be way more severely impacted than Shell has been. It is usual to be in hospital for 3 months. Thank God for Shell’s maturity and grace. It still amazes us and makes life easier for us all. Thank Him for Michelle’s faith, assurance and comfort found in her relationship with Jesus. We are thankful too for the love and support of so many people – for our whole family. Please pray for God to continue to repair her brain – there’s a long way to go yet. Both speech and sensations are impaired. Pray for strength, determination and motivation as she embarks on another 2 weeks of rehab starting on Tuesday. Snapchat fun… just because you can. Birthdays, hospitals, adulthood and all that jazz…. What a week! Michelle turned 18 and we did our best to celebrate and make sure it was a fun day despite the circumstances. Shells slept at home on Wednesday night so we could begin her birthday with our ritual of a special breakfast together as a family (much nicer than being woken up in a hospital room by a nurse taking blood!). She spent the day doing therapy in hospital interrupted by a walk for lunch nearby with mum and dad and then a few friends coming to Camden to help the family celebrate Shell’s life for dinner at ‘Upstairs at Freds’. With the help of visits, Facebook, phone calls and messages, Shell ‘felt the love’ and was able to enjoy her first day as an adult. We saw the Cardiologist on Wednesday to discuss the closing of her Atrial Septal Defect (ASD). Dr Lo laboured the point that he was not sure this was definitely the reason the stroke occurred but it is implicated as the culprit and the hole would need to be repaired either way. The warfarin she is taking to thin her blood ought to prevent another clot getting to her brain but he couldn’t guarantee this either. At the moment she can live a pretty normal life – no scuba diving, flying or drinking alcohol but anything else is OK.
Our time with Dr Lo was very informative and we felt reassured that we were under the care of a very knowledgeable, experienced and realistic specialist. He gave us more than 45 mins of information, showed us various YouTube videos and displayed a calm confidence that he can fix the problem. No date is fixed for that yet as he will discuss it all with the neurologist and get back to us. Here is a link to a video of what will happen inside Shell’s heart. In the last week, we have also come to see that Michelle’s sensation reception is actually more damaged than we had previously realised. Hot and cold, sharp and dull are difficult to discern. The therapy for this is quite tedious but essential; just feeling and noticing and stating things about different items like cutlery, first with one hand and then the other, eyes shut and eyes open. It has been easy for me to be so focussed on the language that I haven’t considered working on this area too much. Yes – language is more important but the brain’s ability to repair can do it all at once. So I am trying to annoy Shell now by pricking her with liquid amber seed pods and stopping her to feel some leaves that are furry, by holding a warm tea cup and rubbing her hands. I have to confess that I am loving the fact I get to spend all this time with Michelle. She was so so busy the first half of the year – spreading her wings and doing a wide variety of things. Seeing her respond to all that is going on for her, the way she handles it with grace and dignity, faith and optimism makes me all the more aware of what a precious soul she is. Last Sunday Shells came to morning church and loved sitting in with the creche kids and they loved seeing her too. In fact – everywhere she goes people are so delighted to see her doing so well. This most recent Sunday Shell and I stayed home from morning church and did speech therapy and she went to church in the evening. She has found these times somewhat overwhelming with so many people, so much noise and so much to concentrate on. But she also loves it; loves the people, the noise and all there is to concentrate on. Last night she was taking notes during the sermon and felt like she was able to follow along with the whole service – another improvement from last week. Michelle is very keen to participate in the Year 13 program as much as she is able to. They go back to classes this week. She worked hard on writing and submitting an assignment reviewing her Fiji trip. She is now spending time working through “Every Good Endeavour” by Tim Keller with Nige so she can do the next assignment. Nige reads some and Shell listens then Shells reads some, and they discuss the content together. This is speech and language therapy in action at its best for Shell. It is productive for the Year 13 course content she is motivated to complete and she enjoys doing this more than the other random exercises she is given as homework. You would be blown away (as we are) by her daily improvement. We give all the praise to God and thank you all for your prayers and support. If today was the end of her recovery she would be able to live a full, rich and God-glorifying life but we are just at the beginning. She will be coming home on Wednesday and we will transition to outpatient therapy. She will need speech therapy regularly and I expect some occupational therapy too. What this will look like is a mystery to us at the moment. We will know more over the next day or two. INR blood test. Not the favourite time of the day! We bumped into a friend today who made an astute observation. ‘Nurse Fran’ asked after Shell (not unusual – most of our conversations at the moment are about her) and made the observation that for people who have had a stroke everything can appear normal to those who relate to them but for the individual, life doesn’t feel anywhere near normal. Things have moved on since our last blog. Michelle has had the hearing test and passed with good results. These good results mean that her hearing difficulties are actually speech related not mechanical. It seems that her brain may have some trouble recognising the sounds of speech as language that is to be understood, processed and responded to. It’s all part of the impact of the damage in the parietal lobe. With the hearing test out of the way it was only a matter of time before moving day! Last Monday she was transferred via a large patient transport vehicle to the Rehabilitation Ward at Camden Hospital. Almost every day we visit we find Michelle smiling and motivated to work on her speech. She’s dressed in her clothes, wearing her shoes with her hair done and holding her book or her phone. She laughs and gladly gives us a bit of sass – regularly. She can run slowly on the treadmill and spent 35 minutes on the exercise bike in her first physio session, 20 minutes walking/ run in her second session and bailed on the offer for her third session! Everything looks normal, but it isn’t. That’s why she is in rehabilitation (not drug rehab – we had to clarify that with one of the kids earlier in the week! )- primarily speech rehab but building endurance will help with this too. Each day she continues to improve, and we notice little things – she can easily say a word she couldn’t say the day before; Megan and Brianna have their own names back; her handwriting is a little faster. It’s awesome to see her brain at work relearning and rewiring itself to enable Michelle to be able to engage with the world as she wants to. We’ve had to manage the number of visitors and will be decreasing the number in the coming fortnight. It has been exhausting for Michelle trying to do rehab and socialise. The problem is Shell is so very relational. Time without friends is punishing and depletes her energy stores too. She is walking on a balance beam and has fallen off now and then which sets her back in her ability to engage fully with therapy. The team here at Camden have an excellent reputation and have been kind and welcoming. The occupational therapist was understanding, thoughtful and caring as she showed Michelle around her three-room unit (seriously) and explained that she would help Michelle learn techniques for using the parts of her body that remain numb. Each day Shells feels like she is getting a bit of feeling back in odd parts of her right side – today it was the inner arch of her foot. Sadly she can’t feel the softness of Nala’s fur when she pats her yet. The speech therapist is seriously lovely. Lucy doesn’t often see such ‘high-level patients’ and she has given serious consideration how to best help Shells. Michelle has a warm rapport with her and said today she liked her a lot – even though her brain hurts when she leaves. I think that is a good thing – just as you exercise a muscle, so you exercise your brain. Many people ask us “How is Michelle?” It is a difficult question to answer. Michelle is Michelle! Everything is normal – but isn’t…. The Campbelltown Anglican Year 13 Crew back together! On the way to the hearing test! Exerising for the first time in 3 weeks!! Oreo Cheesecake from the Terrific Trinette! On the way to Camden! The view from the window with Mr Allard’s orchid. Shell has ordered two juices for every meal for weeks! Yesterday (Wednesday) I caught the train to the hospital expecting Michelle to be moved to Camden rehab early in the day. We had asked a few people to pray the night before for a miracle to happen and for the transfer to take place that very night. Alas, it was not to be. I expected God would answer positively in the morning (as He chose not to the night before). Evidently our desires were not the best. At 3.30pm we found out that the move would not happen. Shell has lost some of her hearing on the right side, and she is having a hearing test – scheduled for Friday morning. She will move to Camden after this on Friday. If not Friday… Monday. I was concerned how Shell would take the news. She was feeling pretty frustrated in the morning. She’s ready to move on and rehabilitate so she can get the most out of the second half of her Year 13 experience. But graciousness prevailed and she took the news in her stride. It’s a joy to see her personal calm and maturity evident most of the time. The upside of this delay (and perhaps an answer to the prayers of others) is that Michelle will have freedom to see some of her Year 13 friends who are very keen to see her and she is very keen to see. They land in Sydney in the next hour. Seeing them will be balm for her soul. I find it imperative to take a step back and look at the whole network of competing interests. Our medical system is, on a global scale, an amazing beast. There are so many, many people working for the good of so many, many people. It is easy to think the world ought to revolve around us. Shell is safe, well cared for and improving daily and God has given us wonderful speech pathology friends who have helped us to help Shell in her rehabilitation while she is still in acute care. The lady in the room next to Shell is in nappies and can’t talk. The man up the hall from her sits in a chair all day and periodically yells out “Help me! Help me!” Our situation is not so hard to bear when looking at the woods rather than the trees. I was reminded of this jewel in the Bible this morning (typed below) whilst I was reading a blog about a friend’s 16 year old with cancer. I do wonder how people can deal with life not knowing the God of all comfort who sustains all things. APHASIA – this is a link to a fact sheet on Shell’s brain injury resulting from the stroke (thanks, Kate Makin). Brie and Brode are in Katoomba!! Another birthday visit. Mum, Sui and Nico drove over not knowing where they would be required to go! The flower is tiring. It’s declaring ‘the work here is done’. At age 17, Michelle had an ischemic stroke in the parietal/temporal lobes of the left side of her brain. About 1/6 of her brain has been affected and her initial primary deficiencies are in cognition and speaking. She also has a numb/tingly feeling on the right side of her body.